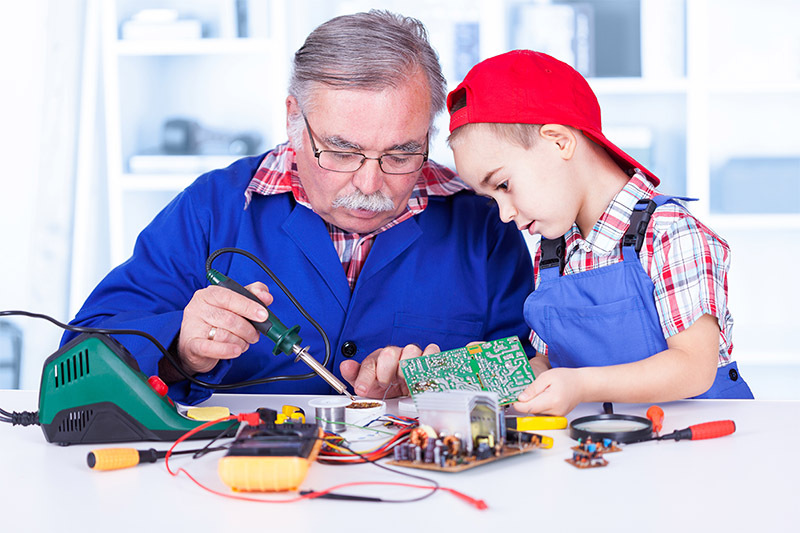 One of the most often asked questions in my inbox is ‘how old is old enough to begin working with electronics? The answer, of course, is that it depends on the individual, what you mean by ‘working with,’ and the amount of supervision provided by an experienced or at least alert adult. I began disassembling radios and electric toys as soon as I could handle a screwdriver. When I was 11, I built a ham radio transmitter with parts recycled from a discarded TV — working alone in my father’s workshop. Today, allowing an unsupervised 11 year old to disassemble a potentially lethal high voltage circuit probably constitutes child abuse in some states. Fortunately, the CRT has been supplanted by the lower voltage LCD display and modern electronics, in general, operate at relatively harmless voltages. If you’re looking to introduce electronics to an eight or nine year old, I’m a big fan of the Snap Circuits series which is sort of like LEGOs with embedded components. The entry-level model is around $30 from Amazon. With color-coded LEGO-like components, you and your youngster can build over a hundred different circuits — from a water alarm to a timer. The problem with the series is that the user manual is written for someone who can read at a high-school level. So, the kit is great for pre-teens, as long as someone who can read the manual and explain the circuits supervises them. Although the Snap Circuit and similar products can be used by teens, the solderless electronic breadboard approach is more fitting for capable hands. It takes a good deal of dexterity to plug in ICs without bending the leads. A breadboard and battery or simple power supply and a handful of components are not only inexpensive, but relatively limitless in terms of circuit possibilities. However, unlike the Snap Circuit, it’s easy to cross connections and burn out components — that is, unless there’s someone watching over the builder’s shoulders. There’s also something to be said for the experience of burning up a few inexpensive components — the lesson can carry over to more expensive circuits later. If you’re a regular reader of this column, you know that I’m a big fan of teardowns, especially when they’re supervised. Nothing can beat a knowledgeable person tearing down a smoke alarm, compact fluorescent bulb, or other device with a step-by-step description of components and circuit theory. One of my early mentors used to walk me through a teardown and then hand me the tools and let me reassemble everything. I’d often end up with a few extra screws here and there, but the lessons stuck. The real challenge today is making the introduction to electronics memorable and exciting. After all, electronics as a hobby has evolved considerably since the days when computers were fabricated with discrete components. For example, if your project culminates in a blinking LED, it’s probably not going to compete well with your smart phone or tablet.